Forum Index > Historical Arms Talk > New Kingston XVIa by Gus Trimat CASIberia? Posted: Fri 29 Jun, 2018 10:07 pm Post subject: New Kingston XVIa by Gus Trimat CASIberia? 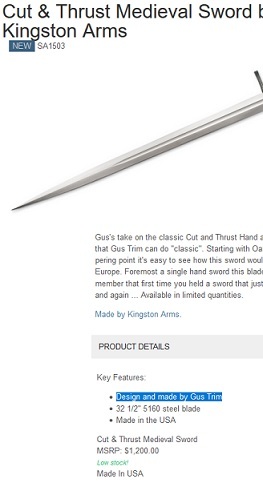 Was I just asleep at the wheel and missed any and all comments on an Gus Trim sword being added to the Kingston Arms line? Every so often, I head over to manufacturers sits and check out any new stuff that is either coming soon or just released. Earlier today I was checking out the CASIberia product page and I came across a "New" Cut and Thrust Medieval sword in the line up that I'd never seen before. I looked at my regular sword-fix sites (KoA, SBG, Therion Arms, etc.) and it wasn't sold on any of these sites, nor was there any chatter on this site about a new Gus Trim design available. The sword looks like a real gem, but then so does every sword Gus puts out these days. I don't usually miss new products, but this one clearly shot right past me! As ever with the stuff from Kingston and Gus, the specs are great! There certainly are things to like about it but that price for a CAS Iberia? Likely I never saw it because CASIberia really overprices their products, so I seldom see their new products until places like Kult of Athena start selling them at more realistic prices. Just curious if anyone had some knowledge about this XVIa. If or when they hit the common market, as a lot of gus trim designs and swords he's made recently are, they could be at a pretty dang good price. CasIberia products are usually street price ~1-300 less than list and places like KOA have sold gus trim swords/knives recently at very good prices while also offering things like his new tactical line at ridiculously competitive prices compared to factory msrp. Make no mistake I like the blade shape and the package. Just seems like the price puts it in the direct from Atrim ballpark. Would be nice to see some other photos too. The one at that link seems to be just one and the color of the treatment on the cross and the pommel seem to be slightly mismatched to me. Maybe I'm seeing something that is not there? I've picked up three in the last couple of years and they were all around the $1,100 price range. This sword however, specifically says that it is made by Kingston Arms, where the Competition Longsword (SA1501) says that it is made by Gus himself. Right, so what I guess I'm trying to say is why not buy the real thing from the real guy if the price is all the same? There is some confusion in the presentation by Kingston Arms, but I'm pretty sure that this XVIa is made by Gus Trim. I think the sentence "Design and made by Gus Trim" under key features might have indicated such. I don't want to seem rude, but it does indeed indicate on the SA1503 page that it was made by Gus Trim (see marked section in attached image). It's in the small print, but it's there, despite the typo. Since Gus has posted that this might be the last year of his production, now would be the time if interested. I've pretty much left the medieval market but still have the two Trims from years gone by. The finish and tuning appears to have gained positive traction in the past few years. With the other two major American four figure makers, it will be interesting days and years to come. Not rude at all, Johannes... It does say that now, but that was just added today. When I first posted this, all it said was "Made in USA". The sword was just released and it is marked as low stock because Gus only makes a few at a time. My basic question was; "Has anyone heard anything about this sword?" I didn't find your comment to be rude in the least.